A while ago I posted my plans for a hallway makeover. It had been a while since I was getting itchy feet about changing things around in the hallway. It's not that there was anything wrong with the Ikea shoe cabinet we had there, it was white and simple so it was fine, but for me that's just it. It was fine. As the first room that you walk into the house, I wanted to create an inviting space. I didn't want it to feel like a typical hallway, full of shoes and bags that are just thrown around. As I mentioned in my plans, we don't actually have that many shoes between the two of us, so I realised that there wasn't any actual need for a shoe cabinet. The main consideration I had when thinking of an alternative was the width of the hallway - it's a victorian terraced house, so the hallway is quite narrow. We can't have anything too large at the risk of dwarfing an already small space. All we actually needed is somewhere to put out keys and lose items, without them being directly on display. The Ferm Living Plant Box from Cloudberry Living seemed like the obvious solution and having seen it in hallways before, I knew it would work. I went for the grey version (of course) as it would help to keep the hallway bright. 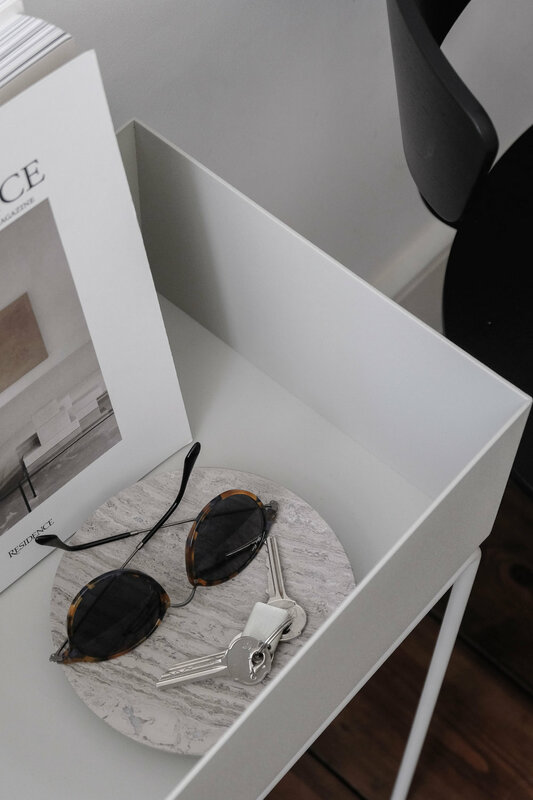 We now have a minimal space to put our sunglasses, keys and other lose items we have on us when we walk into the house, and it's also a great unit to add in magazines, art work or even plants. It's sounds silly to not use a plant box for plants, however I quite like to keep it minimal with a couple of my favourite magazines and some beautiful poppy pods in my Menu vase. As I also mentioned in my hallway makeover plans, I wanted to get a chair to have a place to just slouch down, pull on and take off our shoes without having to always sit on the steps or wobble about. As I am constantly moving things around in the house, I wanted a chair that I would also love to see in my kitchen or dining room and the Herman Chair again by Ferm Living from Cloudberry Living had been on my list for a while. The black powder coated metal frame and slightly raised oval seating makes it a really comfortable seat to sit on for considerable periods of time. My favourite aspect is definitely the curved back which offers great support for the back. I went for the black version to contrast with the light grey planter, and i'm really please how they complement each other. Another exciting addition to the hallway is the Carrie Lamp designed by Norm Architects for MENU from Amara . I've always really struggled with the harsh lighting from the ceiling lights in the corridor. I wanted a soft light that would be inviting, warm, cosy and most importantly, it needed to be LED as there is no power outlet in the hall. The portability factor of it is also a huge bonus, as I will definitely be taking it outside in during evening summer meals out in the garden. I'm so happy with how this space now looks, what do you think? I'm also pleased do give you a discount code for purchased made on Cloudberry Living for 10% off orders over £40 (not in conjunction with any other offers, excluding items on sale). Simple type in First10 at checkout. The Ferm Plant Box, Ferm Herman chair and MENU Carrie Lamp were all gifted for the purpose of this post. All images, words and thoughts my own and I would definitely recommend all of these products and the online stores they came from.